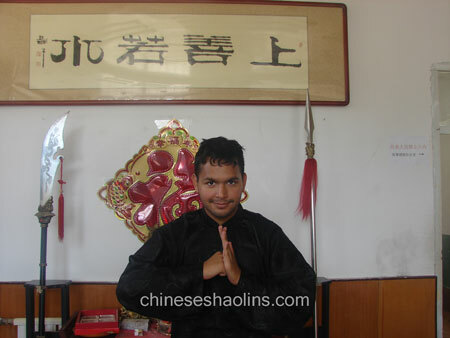 ﻿ Ash Samudre learnt mantis and bagua here. Two months course from July to Sep 2014. My motivation for coming to China was (1) My dad (2) My own desire to learn to fight and (3) My yearning to break out of my shell and become a stronger, better person. My greatest gains are that I have met people from different parts of the world and befriending them helped me see my limitless potential not only as a martial artist but as a person. Many of the shared experiences and ideas between me and them are worth more than diamonds. My shifu (shifu yu) is one incredible man and I am to say I trained under him. Training was a difficult but worth it journey along with the beautiful mountains I climbed, the lakes I swam, the water fall I admire or Yantai city, a place of both splendor and bizarre. These are things I never want to forget and also the training and wisdom I receive from both master and fellow student. Thank you all kunyu mountain stuff!